It is that time of year again and we’re back out in Taiwan for another hot and humid Computex show – it’s arguably the most important IT tradeshow that bit-tech attends. Not only is it a place where the world’s leading PC component manufacturers show off their latest products, it’s also the last major tradeshow before the Christmas spending season, meaning that there are often products shown that are months away from release. Instead of starting our show coverage on the first day of the show, we decided to do things a little differently this year. I flew out to Taiwan a few days early, so that I could go and see some of the largest Taiwanese manufacturers to find out what they’ll be exhibiting at this year’s show. I managed to catch up with Abit, Asus, Gigabyte and MSI in a couple of days while fighting the wonders of jet lag off in readiness for a long sleepless week of tradeshow coverage. Over the course of the meetings, we’ve seen quite a few things. Obviously Intel’s recently announced P35 Bearlake chipset was a feature, but more interestingly we got to see early revisions of boards based on the replacement for the ageing 975X chipset: the X38 Express chipset, which is set for release sometime in September. In addition, we also had a first look at AMD’s first enthusiast chipset: RD790, which comes complete with support for the company’s upcoming Phenom processors. Let’s have a look at what each of the manufacturers showed us. Abit has been readying its three P35-based boards for a while now, and we first got to see them in March at this year’s CeBIT show in Germany. These boards are just about ready for shipping, and performance is looking good thus far, based on what we’ve seen of the boards running in Abit’s labs. Despite the P35 chipset supporting both DDR3 and DDR2 memory, Abit has chosen to only support DDR2 memory on the initial IP35-series boards. This is unlike some of the other manufacturers but, realistically speaking, only those enthusiasts with more money than sense are going to drive down DDR3 lane at this point in time. This is especially the case when DDR3 is currently about twice the price of similar-performing DDR2 modules. On top of the three P35-based boards, Abit also showed us its IX38-MAX and IX38 QuadGT boards for the first time too. These boards are in the pre-alpha stages of development at the moment but the boards’ respective layouts are finalised. There is still quite a lot of work to be done on the BIOS ahead of the September launch though. 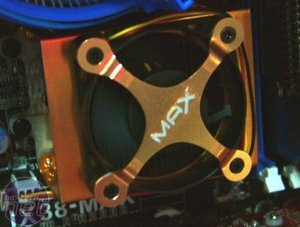 In typical MAX fashion, the IX38-MAX will be Abit’s flagship overclocker’s board and dons the same black and blue colour scheme followed by the company’s recent MAX-series boards. X38 is one of the first chipsets to come with an IHS, and judging by the size of cooling system Abit has implemented onto the northbridge, the X38 chipset is an absolute beast. Abit says that it designed the northbridge heatsink to dissipate around 75W of heat at peak. We don’t think the chipset will ever dissipate 75W of heat at the stock clocks and voltages, but let’s not forget that this is a MAX-series board, meaning that it’s designed for die-hard overclockers and enthusiasts who are likely to push the board well beyond its specifications. Thus, Abit has designed the board with exactly that in mind. There are the usual inclusions like Japanese Solid State Capacitors – which are known to improve long term stability, a five-phase digital PWM for improved voltage regulation, right-angled SATA connectors, along with dual eSATA ports and an external Clear CMOS switch on the rear I/O panel. On top of these features, there are also the overclocker-friendly on-board power/reset switches, and support for Abit’s µGuru technology. 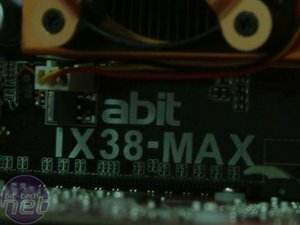 It’s been known for some time that the X38 chipset would support DDR3, so it comes as no surprise to see Abit’s IX38-MAX coming with DDR3 support. 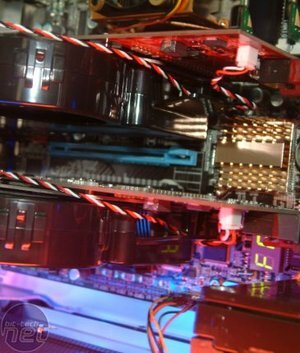 There is also support for PCI-Express 2.0 and Abit has included three PCI-Express x16 slots. The two black slots support dual x16 CrossFire and because they support the second generation PCI-Express standard, they actually offer twice the bandwidth of current dual x16 solutions. However, there is no driver that enables CrossFire on the X38 chipset yet and judging by what happened with the P35 boards, we may not see one until after launch. The blue slot in the middle supports x4 bandwidth and thus should be enough for most hardware RAID controller add-in cards. 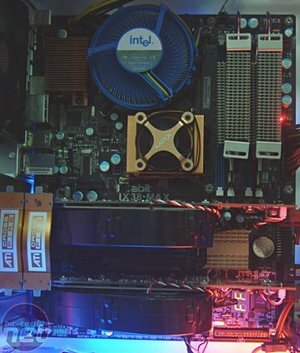 COMPUTEX 2008: If you're wondering about what Computex means to Taiwan and how the industry around it is changing, read on. During a press conference this afternoon in Taipei, TAITRA talked about the expansion at this year's Computex trade show.